The extra-large, 44.5mm version of the quirky ISO. 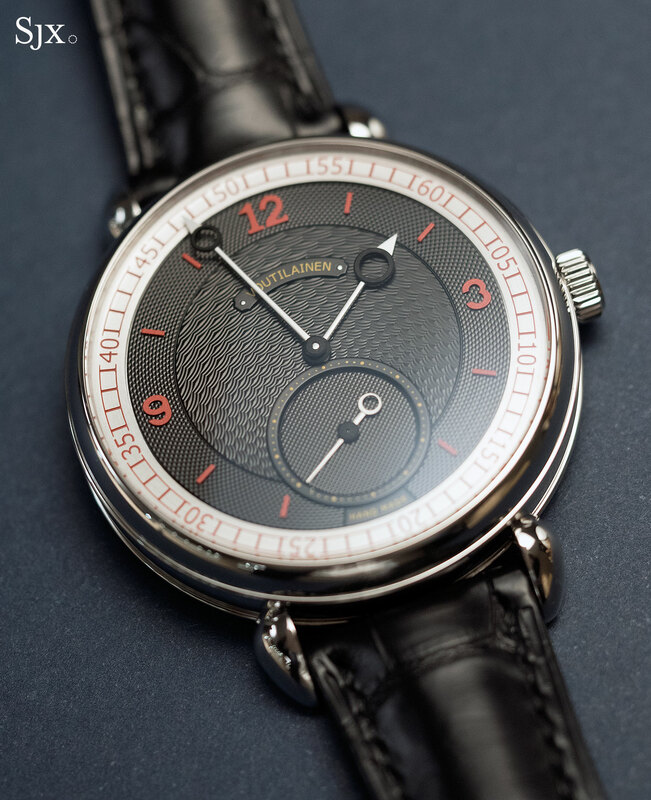 Kari Voutilainen doesn’t often makes oversized watches but occasionally does, having made three to date, including the Vingt-8 in a 44.5mm stainless steel case unveiled earlier this year. Now the same generous size has made its way to the Vingt-8 ISO, combining its unusual time display with striking colours and a weighty platinum case, giving the watch major wrist presence. Introduced at SIHH 2017, the Vingt-8 ISO looks like a typical Voutilainen timepiece but it’s not. 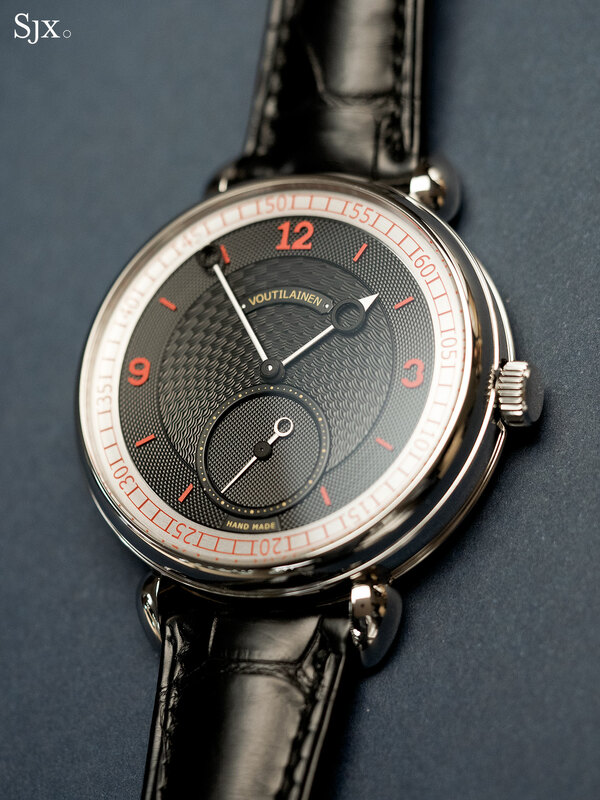 In fact, the Vingt-8 ISO is the Voutilainen timepiece that goes farthest off the beaten track by Voutilainen standards. 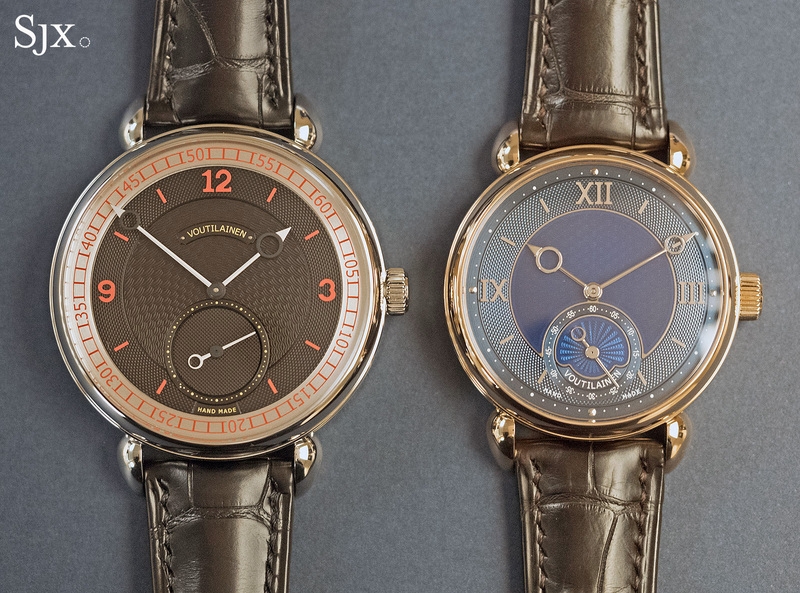 It’s as quirky as a Voutilainen gets. The watch tells the time with conventional hands, except they don’t point to the time as they do on ordinary watches. That’s because the chapter ring bearing the minute track travels with the hour hand, in the same direction but at a different pace. Consequently, at the top of every hour both hands will be pointing to the same hour marker. At eight o’clock for instance, the hour hand points to eight, as does the minute hand. In the photo below, the time is just before 1:45. Once it hits 2:00, both hands will be pointing to two o’clock. Reading the time takes some getting used to, but is fairly easy to grasp. It’s a clever way of telling the time differently while still retaining the look of an ordinary wristwatch. 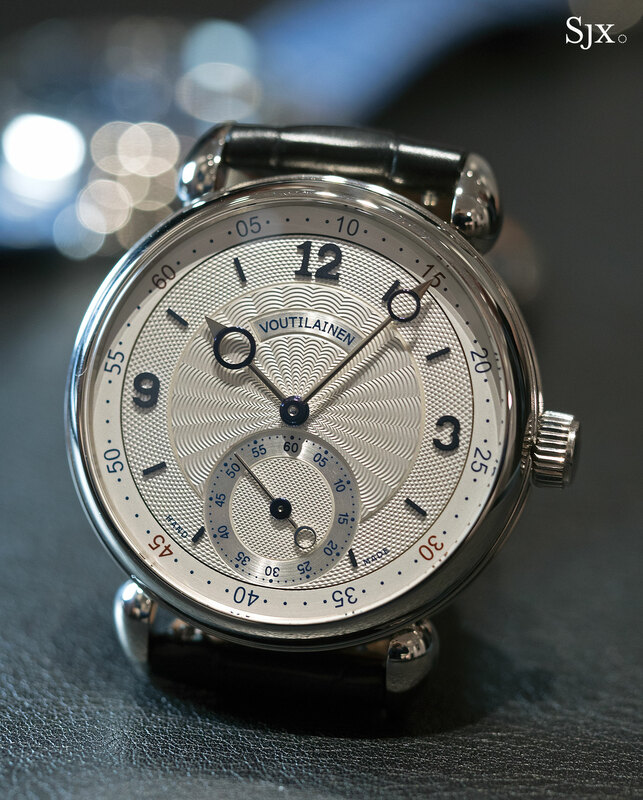 Voutilainen, however, doesn’t take credit for its invention. According to him, the mechanism was patented by a Spanish clockmaker whose name is now obscure. 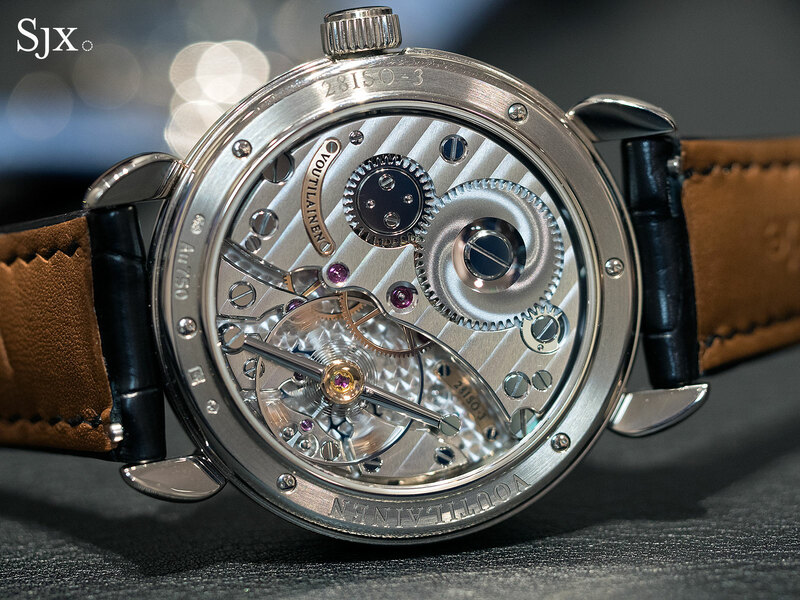 The Vingt-8 ISO is usually offered in the standard 39mm Voutilainen watch case – the ISO calibre is the same size as the regular version – making this enormous 44.5mm version a one of a kind timepiece (until another is ordered). 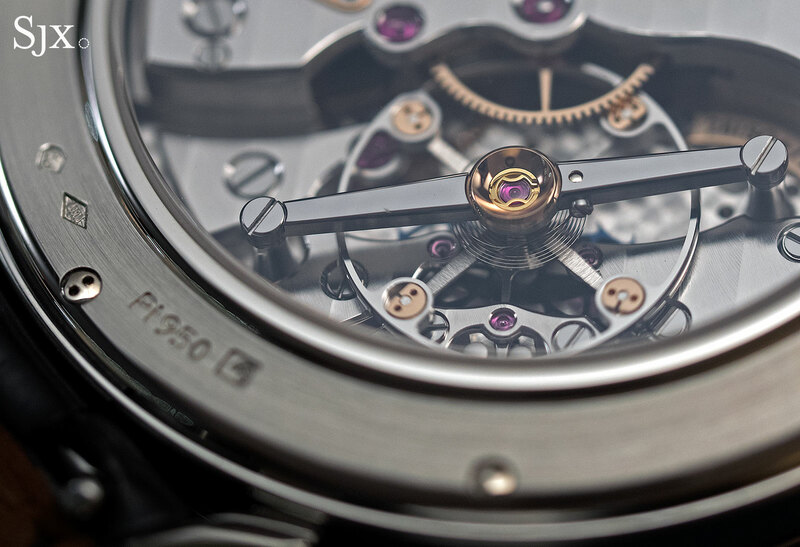 Despite being noticeably larger than the 39mm model, the oversized Vingt-8 retains the same lugs spaced 20mm apart, making the watch seem even larger than it is. That’s not a bad thing, given the style of the watch. 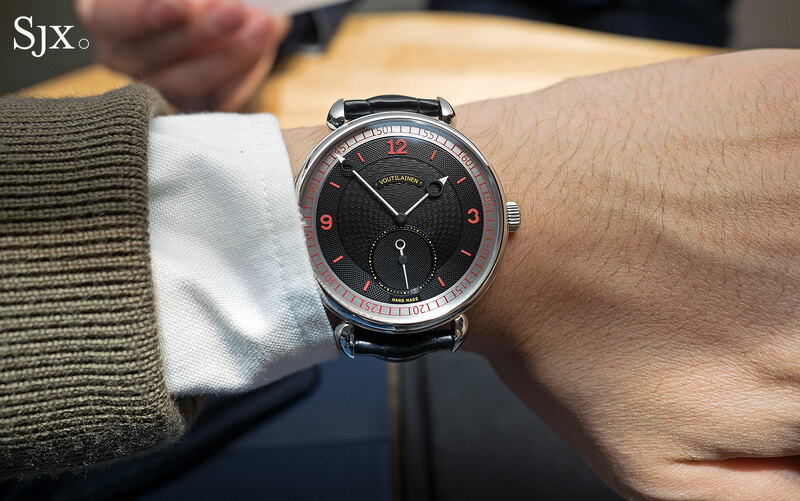 Typically Voutilainen’s watches look most handsome in conventional sizes with a restrained colour palette, which the oversized Vingt-8 ISO is anything but. 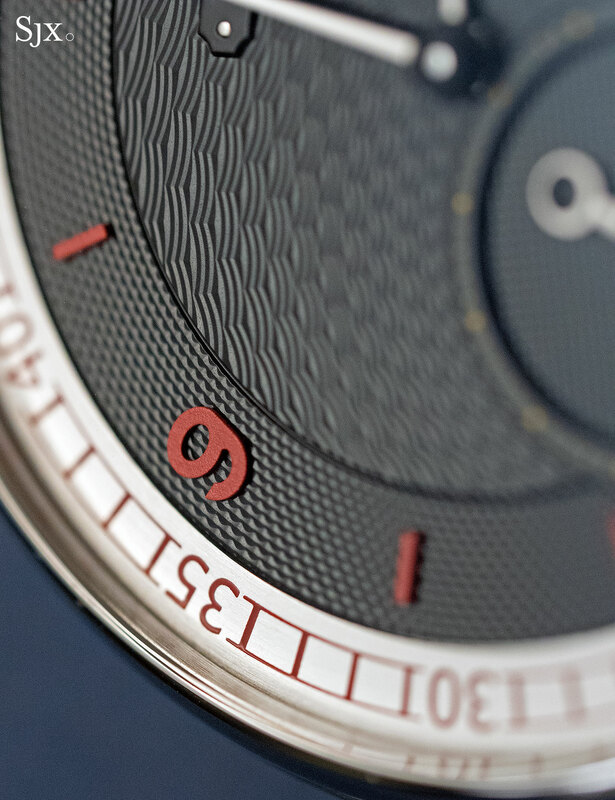 The dial is black with three guilloche patterns, basketweave in the centre, barleycorn on the hour track, and hobnail on the subsidiary seconds. That’s combined with black and white hands – which have a matte, frosted finish – while the lettering and seconds markers are in yellow. And to top it all off, the hour markers and minute track are orange. The look is peculiar and initially disconcerting but the combination works with the very large case size, making it feel a bit more fun than the average Voutilainen chronometer. Inside is a variant of the calibre 28, modified for the ISO time display on the front but in terms of construction to suit the larger case size. 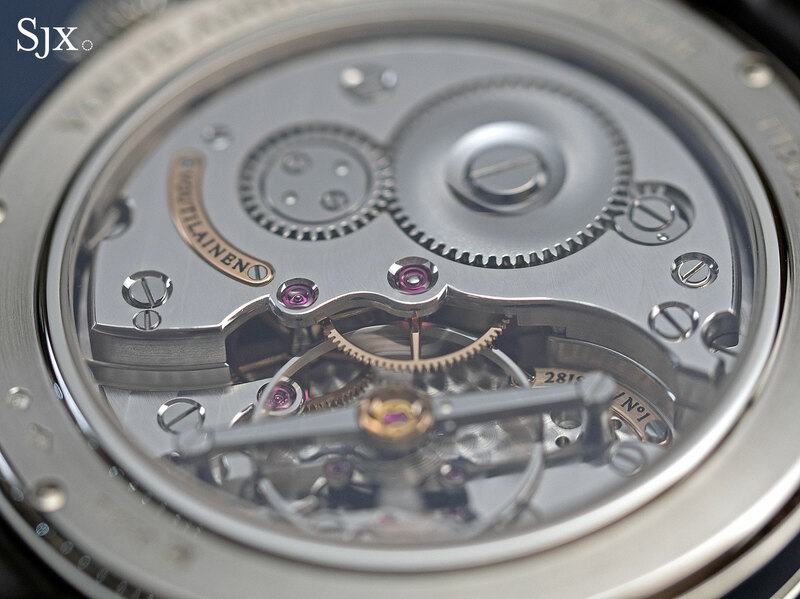 All of Voutilainen’s oversized Vingt-8 watches have a similar movement inside. The bridge and base plate are larger, while the barrel bridge has been reshaped, as has the balance bridge. Instead of the usual rounded arms found on most calibre 28s, this has straight, flat-topped arms. 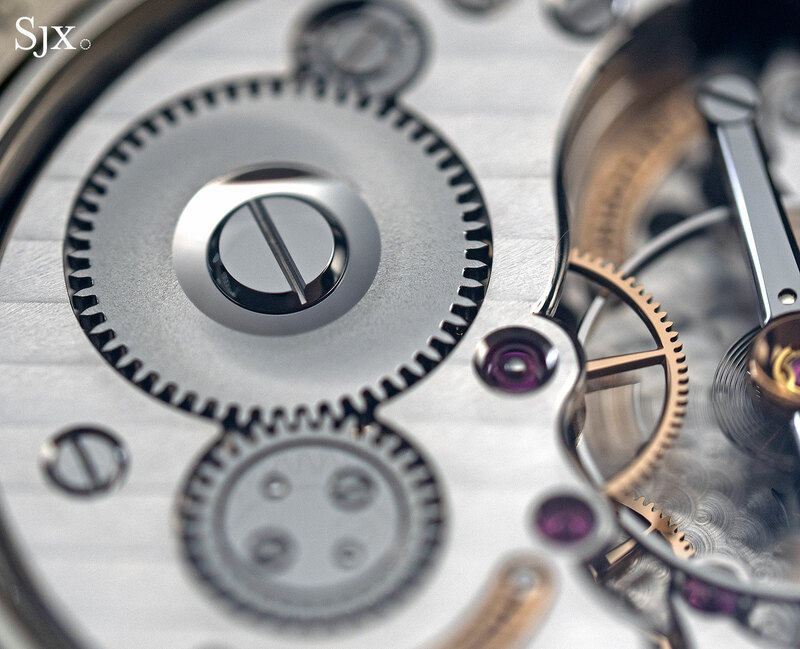 Though larger, the movement is no less refined than a regular sized Voutilainen calibre. 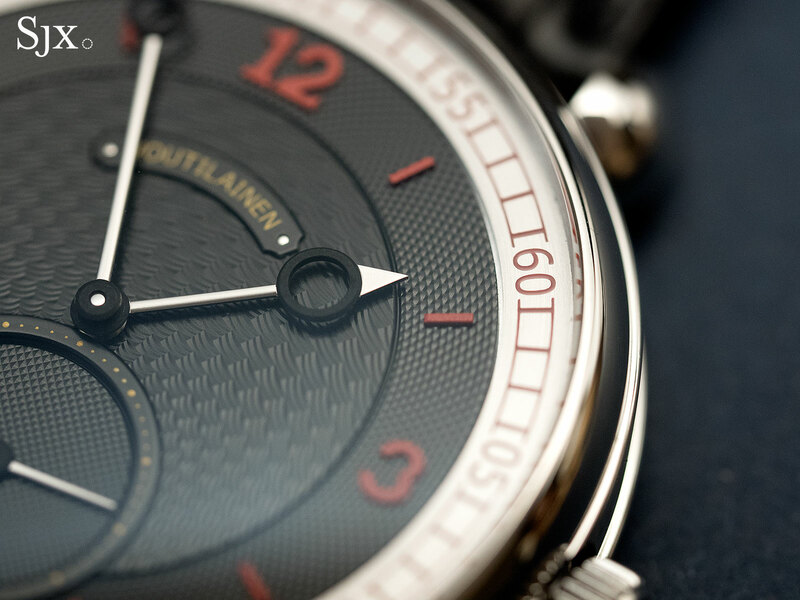 Up close it reveals the same degree of thorough hand finishing that characterises Voutilainen’s watches. The oversized Vingt-8 ISO in platinum is a one-off creation, priced at SFr98,000. That’s about 10% more than the standard size, 39mm Vingt-8 ISO in 18k gold that retails for SFr89,000. 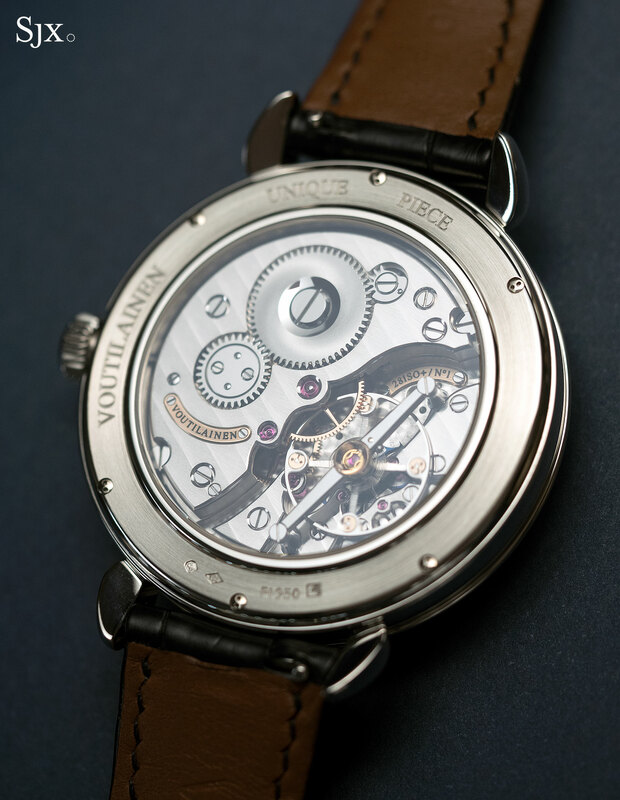 A extra-large version of Voutilainen's signature chronometer, with a movement redesigned for the bigger case.